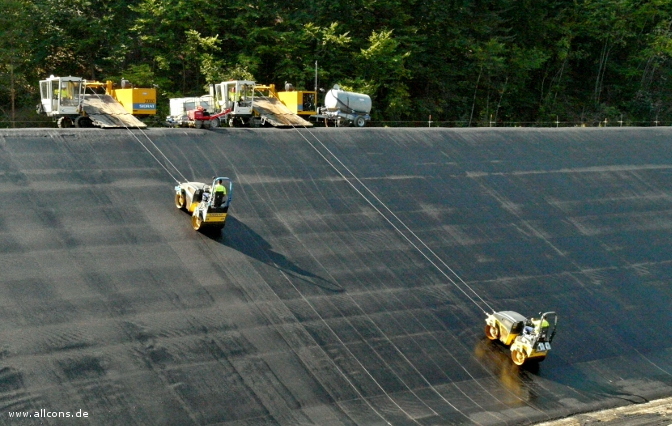 for continuous lining of embankment dams, designed to pull and hold off-the-shelf asphalt finishers and concrete slipform pavers for working safely on slopes, including a high-volume feeding system and a material transfer vehicle, provided to build asphalt- and concrete-face rock-fill dams. 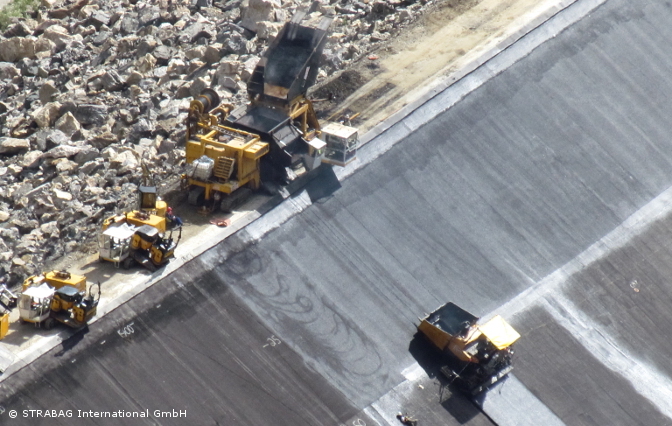 for working safely on slopes with off-the-shelf asphalt finishers, road rollers or concrete slipform pavers, feeding can be done by chute, excavator or telebelt. economical winch carriage with diesel-electric-hydraulic drive concept, for working safely on slopes with working platforms, particularly suitable for rehabilitation projects and reworks. 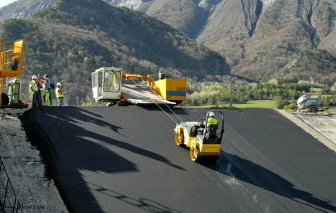 Several accessories for working on slopes are available: Working Platforms, Material Transfer Solutions, Mastix Distribution Vehicles, Cold Milling Machines, Joint Heaters, and many more. approved by the relevant German accident insurance for professionals. 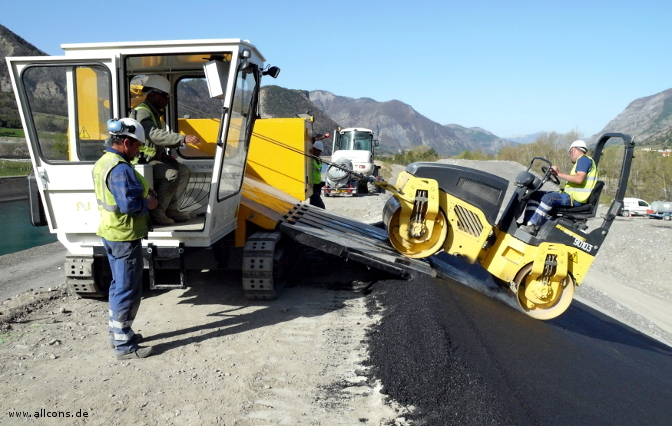 When the mooring mode has been activated, the winch safely holds the tethered machine on the slope, and compensates for the grade resistance (traction force is adjustable). 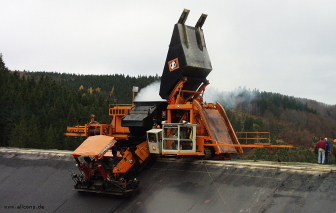 Thus the machine can drive up and down the slope under its own power. 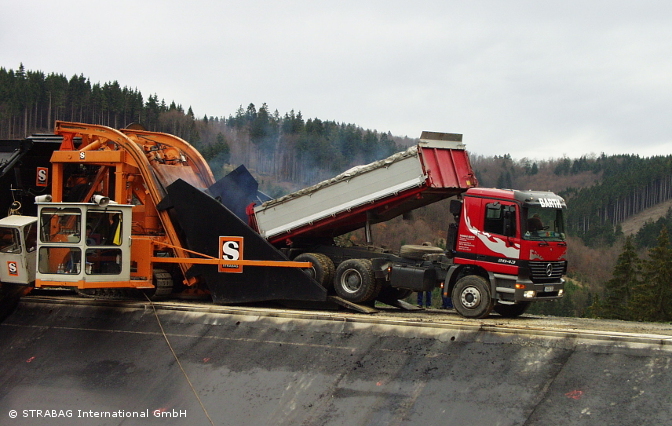 In order to move the tethered machines laterally along the canal slope, they can be winched out onto the hydraulic ramp and then be moved to another location. A crane arm for general use, e.g. for lifting milled material out of the slope. The advantage of the drive concept of the service carriages is the availability of mobile electrical power. 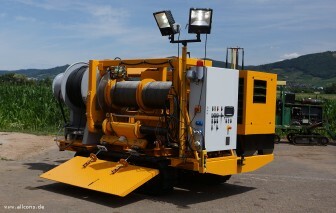 For example, it can be used to supply radiant heaters for the repair of asphalt surfaces or for mobile welding jobs. 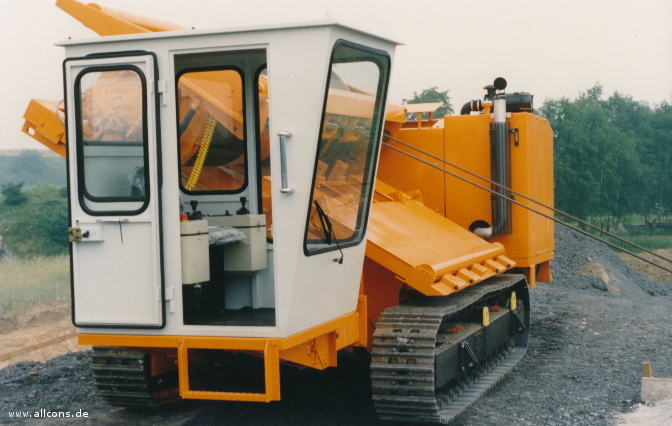 The motor driven cable reeling drum is provides electrical power to the working platform on the slope. To avoid slack in the cable, an automatic reeling mode can be activated. To control the winch and the cable drum on the slope (e.g. 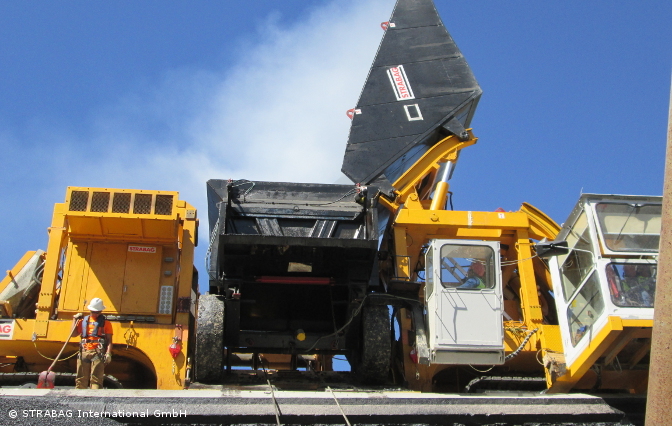 from a working platform), a remote control is provided.